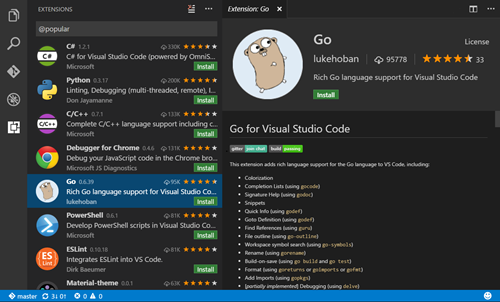 I've been a fan of Visual Studio Code (the free code editor) since it was released. But even though it continues to update itself as I use it, I didn't really grok how much cool stuff has been going on under the hood. But the REAL star and the REAL magic in VS Code - IMHO - is the growing VS Code Extension Gallery/Marketplace. Go check it out, but here's just a taste of the cool stuff that plugs nicely into Visual Studio Code. Docker Support - This extension adds syntax highlighting, snippets and additional intellisense for Dockerfiles and docker-compose files in Visual Studio Code. Cordova Tools - Code-hinting, debugging and integrated commands for Apache Cordova (PhoneGap). With added support for the Ionic framework. Sublime Text Keybindings - Use Visual Studio Code with all your Sublime Text hotkeys! HTML Extensions for VS Code - Everything you need, HTML5 snippets, CSS/JS formatters, HTMLHint and more. TONS of themes - Make VS Code look however you want. Debug your code running in Google Chrome from VS Code - Yes. Read it again. Get it. Bash Debugger - Debug those massive bash scripts you know you have. Vim Emulation - Why not? :wq! PHP Debugging - Deeply useful. Language Support - There is SO much here. Every language you can think of. PHP, Go, Ruby, C#, C++, JS, Rust and more. What are your favorite VS Code extensions? Sponsor: Big thanks to Telerik! They recently published a comprehensive whitepaper on The State of C#, discussing the history of C#, what’s new in C# 7 and whether C# is still a viable language. Check it out! My favorite so far is an easy way to run a website in IISExpress: open the folder in VSCode, CTRL+SHIFT+P, type IIS + return, return. Done! Is the team that works on VSCode different to the team that works on Visual Studio? It's effectively yet another programming font, but with a twist - it uses font ligatures to create distinct glyphs for the usual multi-character sequences (like =>). Visual Studio Code is supported and, after a quick adjustment period, I find it makes reading any code, be it C#, JS or even HTML, much easier on the eyes. I'm still in the dark as why I might want to use Visual Studio Code rather than Visual Studio 2016? The speed and languages supported. It is something between Notepad++ and Visual Studio, but if you don't do full blown C# for example Visual Studio is to much, I do C#, Powershell, CSS, json, xml and others, VSCode is way better for fast and multiple instances of editors. @Robert, Visual Studio Code is a lightweight code editor, not an IDE. You'd want to use it anytime you'd use something like Notepad++... and more, actually. For things like PowerShell scripting, simple web development, writing markdown, scripting, etc., the agility of VS Code outstrips VS. Even if you prefer VS for some of what I mentioned, there's simply no denying that there's times a simple editor is preferred, or do you never use Notepad or one of it's many replacements? I never use any Notepad variation for development because typically I on projects that involve multiple file types, i.e. I don't do just C#. I'm typically editing C#, CSS, HTML, node.js etc... all in one. In addition I guess the question stems from this article about extensions that add back functionality that VS already has. My question towards start of comments - is that VS seems to be getting slower earlier versions were not as slow as VS 2015, I've not tried the 2016 preview yet so perhaps the changes they've been working on related to speed will solve all that. I'm hoping that the VS and VSCode are not the same team. VSCode is an attempt by Microsoft at getting Mac and Linux developers as well as Windows (people without VS). This along with all the open source coolness has made for some exciting changes. Makes .NET an option for a large percentage when in the past it was not. @Peter they aren't the same team. I believe the biggest reason for VS becoming slower is due to the use of Roslyn. In particular, if you have a very large project with really large source files things can become unbearably slow. I wouldn't give up the functionality we get with Roslyn, though. There's your "notepad", along with Intellisense and all the syntax highlighting for virtually any language you'd want to use. I get Mac or Linux development, but for Windows I'm struggling to come up with a good use case for it over VS proper. I'm reading "heavy" but maybe I'm just spoiled on decent 16 gig SSD machines (which seem reasonably affordable today) both at home and work? That heavy feeling I felt before going SSD has completely gone away for me. It's not unusual for me to have 5 or even 10 instances of Visual Studio open at work, and I don't hesitate to fire up another one to "test something" if the new file thing won't suffice. Some people have said my extension 'SnakeTrail' is good for presentations. I like it for just coding. Just want to clarify, are all the extensions in the market store are genuine and verified by Microsoft? Don't want to install something on my machine from some random person which potentially is a security risk. No, extensions on the marketplace are not "verified" by Microsoft as far as I know (maybe they have some static analysis or something, but I doubt it). FYI, this is the same for the Visual Studio (not Code) marketplace as well. Does it make sense to install VS Code if you already have VS installed? @Alex- it definitely makes sense to install VsCode because it's like notepad if you need change your CSS or anything instead of opening full visual studio you can do it.Also, now there are so much support for C# sometime I feel that you even don't need full visual studio also. Recently I have used VS Code much more than the full blown Visual Studio, because it is much faster (even on my 16 GB SSD machines). It also fits the "the folder is the Project" approach better that is used in web development and can use the same configuration files than the rest of my toolchain. On Windows there is the VS Communtiy edition which is effectively VS Pro for small (5 or less) teams or hobbyists, therefore VSCode in terms of functionality is not needed for Windows users. @Peter, I can't agree. I live in both all day long. Visual Studio for larger C# projects, and Visual Studio Code for nearly everything else. @Arul, what do you mean by "best way to write markdown"? Markdown is supported out of the box. There's a markdownlint extension I use as well. This covers most of what one would want. There's lots of other markdown extensions as well, so it all really depends on what you're looking for specifically? Just in case it's useful to anyone, I released a project yesterday that I've been working on for some time, and that really resonated with a lot of folks yesterday, quite unexpectedly. It's nightly builds of VS Code for Chromebooks and Raspberry Pi (ARM and Intel packages). These builds aren't exactly matched to the Insider builds, but they're the same idea (code cut once a day, tested, packaged and deployed). Hope someone finds it useful. Would love to hear your thoughts on this Scott! Personally I prefer Visual Studio code for writing Angular (1 and 2) apps. It works much better with Typescript. @wekempf I guess it must depend on the project you work on. For me I'm working on an ASP.NET MVC app therefore I have VS 2015 open, since it's a web app the CSS/JS etc.. is also included in the MVC project. Given that I already have VS 2015 open for working on the C# bits why would I open another app to work with files that VS 2015 already has open? Is the SASS/CSS and JS editing features of VSCode dramatically better than VS2015? If not or it's simply on par then I honestly see zero reason to have it in my scenario. Having a 2nd app open mimicking what the 1st app does is a waste of resources. Thanks for this post. I'm getting started in the Mac environment and have been looking for a code file editor. NEEDS an add new C# class extension. Wow, Scot you made my day by this info. Why am I so much excited about VS Code is? Actually, I was looking for a comprehensive code editor for my web projects. Thankfully now I got a good one via VS Code. I am gonna try it for now. Looking forward to seeing what's exciting inside. I started using VS Code recently in anger for node dev and I love it, so much so that I am no longer using Sublime. The syntax completion and debugging are great, it opens fast, and ever since tabs made it in, I am a very happy camper. Add to that the inline terminal window. Job well done Microsoft! I wrote the VSCode extension for highlighting the syntax of Zeus Z80 assembler files from my old ZX Spectrum computer. This couldn't be done so easy on VSPro. So VSCode has an incredible customization power. Visual Studio has been the programming language ever, its easy and very user friendly.